According to the mission website, the New Horizons spacecraft has drifted off to sleep, entering its "hibernation" mode for the first time. New Horizons will hibernate -- coast at a slow 5-rev-per-minute spin with most of its systems powered down -- for 75% of the next eight years as it cruises to Pluto. That's not to say they've just shut down New Horizons for six years. In fact, this first hibernation is just a "nap" lasting two weeks; it will wake up for 10 days of activity in mid-July. Its next nap will last about a month. Even during its naps, some critical systems are still running and monitoring the health of the spacecraft. Through its medium-gain antenna, New Horizons will broadcast a beacon tone indicating its state of health, which the Deep Space Network will check in on twice weekly. (A "green" tone means "all's well," while a "red" tone would mean "Hey, team, something's not right! I need help.") Over time, as New Horizons' operators gain more confidence in the spacecraft's ability to slip in and out of this hibernation state and maintain its health, these contacts will become less and less frequent, and the short naps of weeks will give way to longer sleeps of months. Through most of this, New Horizons will be coasting, with no need for any further firing of its engines. In fact, New Horizons has not fired its engines at all since March 9, 2006 and won't need to again until September of this year. March was only two months after the launch. In the meantime, New Horizons flew by Jupiter and all its moons. The engine burn that it did in March 2006 seems to have been targeted absolutely spot-on to keep New Horizons on almost exactly its desired course to Pluto, even through the Jupiter gravity assist flyby. That's utterly amazing. Even if they did not do an engine burn in September, they'd only miss their flyby distance by 300,000 kilometers. That may sound big but it's less than the distance that separates Earth and the Moon, and it's actually plenty close for New Horizons to do quite good science. Even if New Horizons suddenly lost its propulsion system, it could still at this point do a Pluto mission in 2015. When they speak of planetary navigation, space agency media officers like to trot out tired analogies such as "it's like hitting a golf ball in Los Angeles and sinking a hole in one in New York City," which always makes me yawn, especially because most spacecraft do perform mid-course trajectory correction maneuvers to line up for planetary flybys or orbit insertions. Most golf balls aren't equipped with thrusters to perform such maneuvers. But I think that New Horizons not needing any further course correction to get within spitting distance of Pluto after a gravity assist flyby and an eight-year cruise is pretty amazing. My compliments to the navigators! 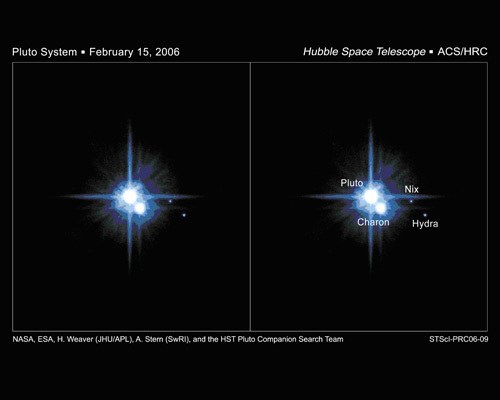 Pluto, Charon, Nix, and Hydra, as observed by the Hubble Space Telescope on February 15, 2006.